Stay Connected and Live the Moment with Robo Buddy™. Connect to Robo Buddy™ on your smartphone or tablet from anywhere in the world via free app and local Internet! Robo Buddy™ gives you peace of mind by keeping an eye on those things that matter most. Robo Buddy™ is your baby monitor, home monitor, pet monitor, or delivery vehicle. Live stream high-definition photos and videos from the built-in HD 720P video camera. Move Robo-Buddy™ forward, backward, right or left with the Move Motion feature. 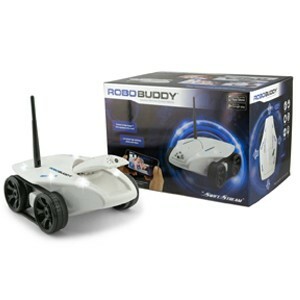 Robo Buddy™ can travel for up to 50 minutes and then recharge on the docking station (included). Infrared vision allows you to see in the dark! Two-way audio communication allows you to speak and hear!